Free online Cesaro polygon fractal generator. Just press a button and you'll get a Cesaro polyflake. There are no ads, popups or nonsense, just an awesome Cesaro flake generator. Press a button – get a Cesaro polyflake. Created by mathematicians for mathematicians. n-sided polygon Number of initial polygon's sides. Transformation rule Transformation rule for polygon's sides. Preview Rule See the transformation rule. How to write transformation rules: Letter F denotes the segment, plus or minus - rotation right/left, numbers in parentheses - angle. Background Cesaro polygon's bg color. Line color Cesaro polygon's line color. Internal color. Cesaro polygon's fill color. Line Width Thickness of Cesaro polygon's sides. Padding Padding around Cesaro polygon. Select Direction Which direction do we start drawing? Cesaro polyflake generator tool What is a cesaro polyflake generator? 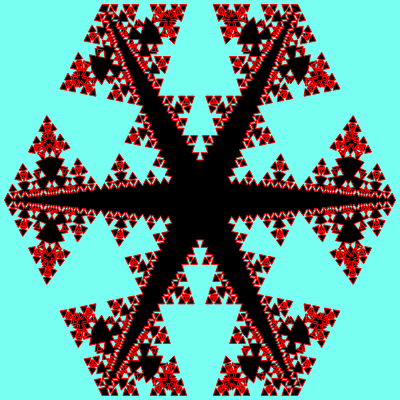 This tool creates Cesaro polyflake fractals. A Cesaro polylake fractal is sometimes also called as Cesaro polygon, Cesaro n-gon, Cesaro n-flake, or simply Cesaro flake. This fractal is very similar to the regular Cesaro fractal. In both of these fractals, you specify an initial polygon shape that the fractal will evolve from. In the regular Cesaro fractal, each side of the polygon is bent only once at a certain angle, but in Cesaro polygon fractal you can set the transformation rule for the polygon sides yourself. To do this, you need to write down the rule for the new polygon side using L-system notation. You need to use letter F to denote a step forward, plus and minus signs followed by a positive or negative angle in parenthesis for rotating the line. By formulating this rule, you can explore Cesaro n-gon behavior for any number of iterations. You can also change color palette for the polygon sides, background, and polygon fill. You can also control polygon sides' thickness, padding and starting drawing direction. 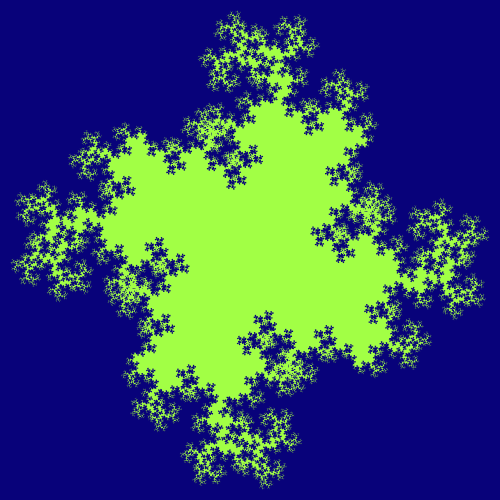 To get a high-quality picture, change fractal's width and height to higher pixel count. Mathabulous! In this example we create a transformation rule with five segments. What this means is each base polygon's side gets replaced with a five-segment zigzag. There are various angles between zigzag segments, some are positive, such as +(30) that makes zigzag rotate 30 degrees to the right and -(170) that makes it turn 170 degrees to the left. In this example we use a short rule from four segments and apply it to a triangle. We use a black background color, a red outline, and a yellow fill. We get an unusual fractal shape, similar to burning coals. 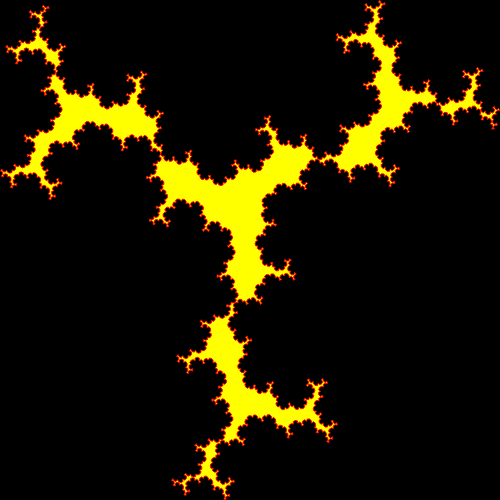 We also recurse this fractal for 6 iterations, change zigzag's width to 1 pixel and remove padding by setting it to zero pixels. This example uses a transformation rule similar to a wavy shape. Each wave segment is rotated only by a small angle so that it's smoother. We create this fractal from a hexagon without coloring its sides and do 5 iteration steps. This example uses only positive and negative angles equal to 110 degrees in its substitution rule. Only after five iterations this Cesaro pentaflake acquires an unusual star-like shape with small patterns around its edges. In this example we use acute, obtuse, and right angles for constructing the polygon transformation rule. 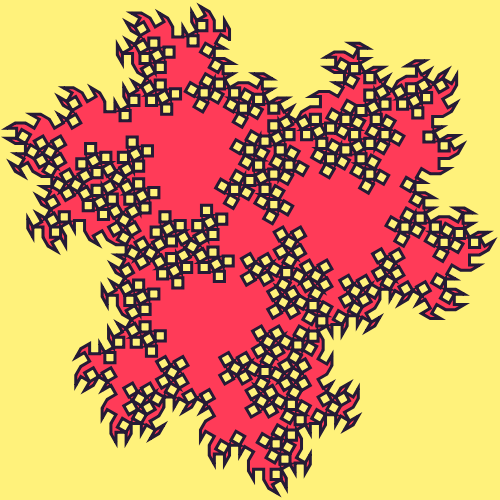 By forming the fractal from a triangle and running it for 5 iterations, this transformation creates an unusual shape with tiny holes within the polygon and firey flames on the outside. We also changed some options such as set the starting movement direction to up and resized fractal to use a 500x500 pixels square frame. This example demonstrates the Preview Rule option. This option helps you construct transformation rules. 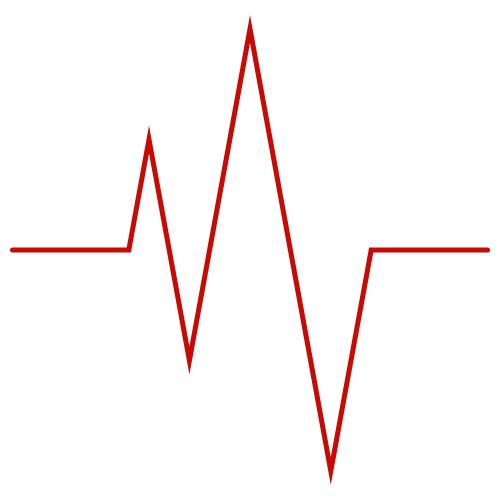 In this case, we've created a rule in the form of a heartbeat. Note that all angles of the transformation rule must add to zero so that the polygon stays closed. 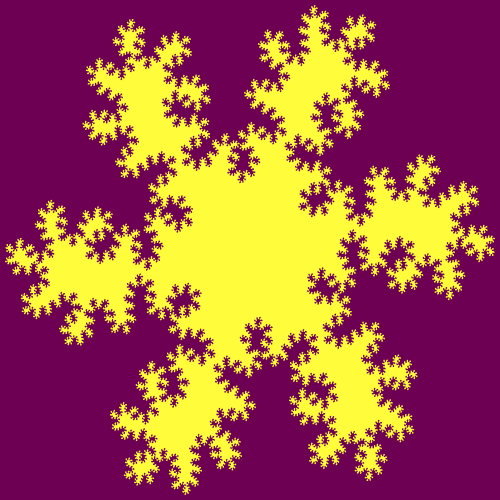 If you want to see what fractal will come out of this rule, just click on this example, and then remove the check mark from the Preview Rule option.